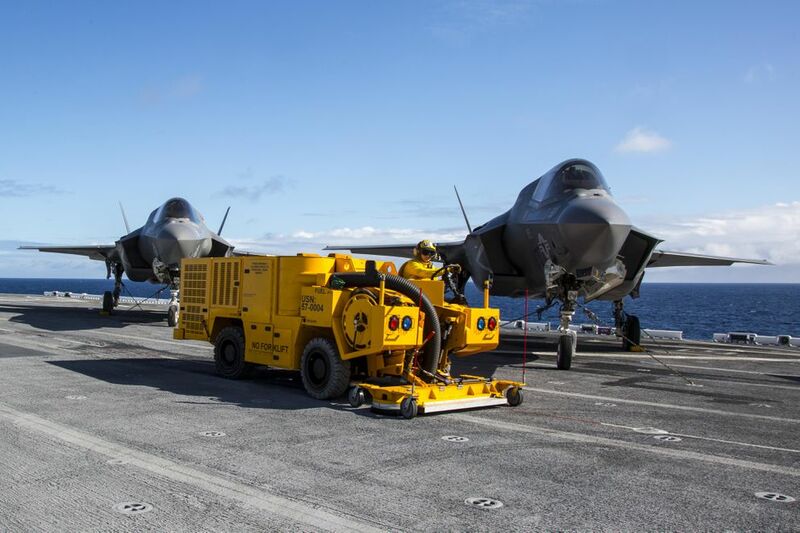 PALMER — A 22-employee startup company here invented a machine that is cleaning the decks of aircraft carriers all over the world. Hans Vogel, president of Triverus, said there is no reason Alaskans can't compete in high-tech, high-value manufacturing, which is a key knowledge-based driver of the world economy. I arrived unconvinced, pulling up Monday morning to a metal building in an industrial park near the Alaska State Fair grounds. I left a believer. Without government subsidies or big-time investors, Vogel and his colleagues are competing with defense companies all over the country. Their patented technology protects the environment, reduces interruptions to Navy flight operations and reduces risk of accidents. They have also sold dozens of less-expensive cleaning machines for civilian runways, roads and sidewalks all over the U.S. The business shares a roof and workers with a company called Trijet, which creates high-precision metal parts. Monday, a single worker was running off aluminum pieces for a handheld X-ray device for inspecting baggage, which is made in Texas. The computerized milling machine turns a metal bar into a part in minutes. 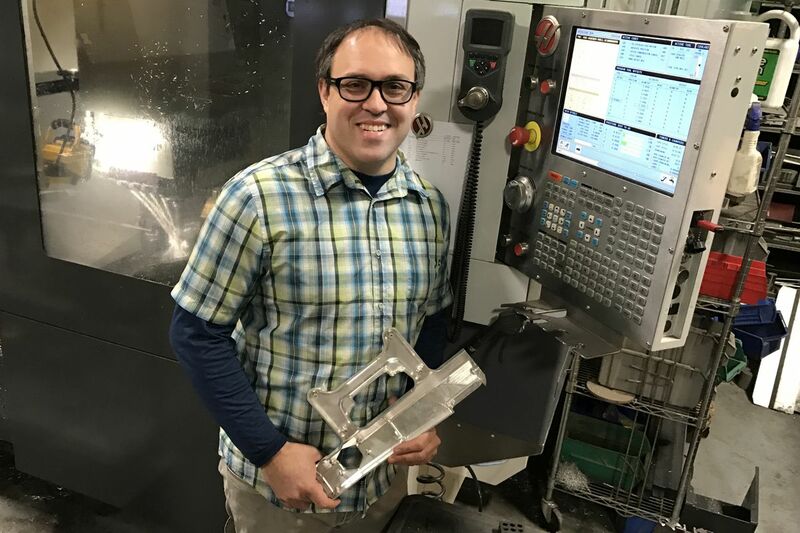 "We're essentially competing with every other machine shop that exists," Vogel said. "We're doing this. We're shipping metal parts out of here all the time." Other Alaskans build high-end fat-tire bikes, specialized equipment for aerial photography and carbon fiber skids for landing helicopters on snow. Their competitive advantage is that they're Alaskans. They like living here and they know how to make things. "It just happens that Alaskans are resourceful," Vogel said. Vogel's firm, Triverus, may have taken it further than anyone else. The company has sold seven cleaners to the Navy, at almost $1 million each, and hopes to build another 50. The Naval Surface Warfare Center put out a call about 15 years ago for new technology to clean flight decks. The accumulation of fine debris on decks is a threat to aircraft. Oil and other contaminants can make the surface too slippery for flight operations. Past procedure required the ship to store aircraft below decks while sailors cleaned the flight deck with brushes and soap. Cleaning took the ship out of action, used a lot of water and allowed oil and soap to flow into the ocean. The Navy's specifications called for a machine no one knew how to build. It would clean the deck with nothing but water, which would be contained, cleaned and reused rather than wasted. And the machine had to operate under heavy use for long periods in a corrosive environment with quick recovery from breakdowns. When the call went out, Vogel had quit his job at a shipyard in Virginia and moved to Eagle River. Like a lot of people, he had fallen in love with Alaska while on vacation, but he still wanted to use his degree in metallurgical engineering. The business started in a garage in Muldoon. The Alaskans' ideas were good enough to win a contract to develop a prototype. Technology made it possible. The engineers in Palmer design equipment in three dimensions on computers. The files they create print directly to computerized metal cutting and milling tools in the shop that can make pieces of any shape without human intervention — work that would have taken old-fashioned machinists many steps. Obtaining that equipment, one piece at a time, was part of the process. Vogel said no vendor existed in Alaska for the parts Triverus needed. They started Trijet to produce parts reliably, on time and at the same cost as sourcing outside Alaska. As it built capabilities, the company also began making parts for many other uses, including after-market aircraft accessories, oil well drilling tools and even metal signs designed by artist Ray Troll. A water-jet-powered tool cuts large sheets of steel up to 3 inches thick using computer instructions. Eric McCallum, founder of Alaska Wire Rope and Supply, became the main investor in Triverus. He started his business, which manufactures rigging and lifting equipment for the oil, fishing and mining industries, in the 1980s, when he was laid off from another supply business. With his success, McCallum wanted to give back to Alaska by investing in startups that would create jobs here. Several other angel investors are trying to do the same. "There's plenty of capital," McCallum said. "It's harder to find strong, fundable ideas." Vogel's machines clean carrier decks while planes continue to operate. Using water and an air vacuum — no brushes — they get the rough surface cleaner than hand washing. A single 200-gallon tank of water lasts a week. The machine separates out oil, dirt and debris, which sailors can remove in a tray-like container. When the machine breaks, every component — even the engine — can be swapped out in one hour by unskilled workers without tools. After a few years of use, the machines will be reconditioned in a Triverus shop in Vermont (it is located there because that's where one of the employees wanted to live). Vogel showed me video of the remarkable results. He has run the machine at sea, including on a recent voyage off Japan. He idled it while catapults on each side launched F-18s. When a plane took off, he pulled forward to clean up behind it. Navy work seeded the technology, but the company has sold many more machines to municipalities and airports — Ted Stevens Anchorage International has one. Without the top-end capabilities the Navy needs, these units sell for around $200,000. The environmental benefits of the closed system make the technology attractive in areas like Puget Sound that have problems with storm water pollution. This little shop in Palmer takes in raw metal and puts out this high-tech equipment. For high-value manufacturing, Alaska is not too far from markets. Alaska minds can create jobs. We have more than resources to remove from the ground or water. But success in this kind of industry takes innovation and technical know-how. Unfortunately, the resource we seem to be lacking in abundance is good ideas. I'll try to learn more about that problem in future columns.